Visioning/ concept design, design programming, community/ stakeholder/ client engagement, concept design, budget and development. From the vision to construction documents. This intensive, three day workshop provided practitioners with state of the art, evidence based design thinking for indoor/outdoor educational spaces for young children. Visits to best practice demonstration sites, applied theory, evaluation tools, and hands-on application will help participants think critically and creatively in implementing best practice design strategies serving young children in childcare centers, museums, public gardens, parks, etc. Through field expert presentations, case studies, site visits, environment-behavior design theory, and hands-on design charrette in a small-group setting participants will acquire skills to execute early childhood designs that fit organizational culture, institutional context, and budget. Michael Lindstrom, AIA, (co-founder, Harvard Childcare Design Institute), studioMLA Architects, Brookline, MA. Robin Moore, Dipl.Arch, MCP, Hon. 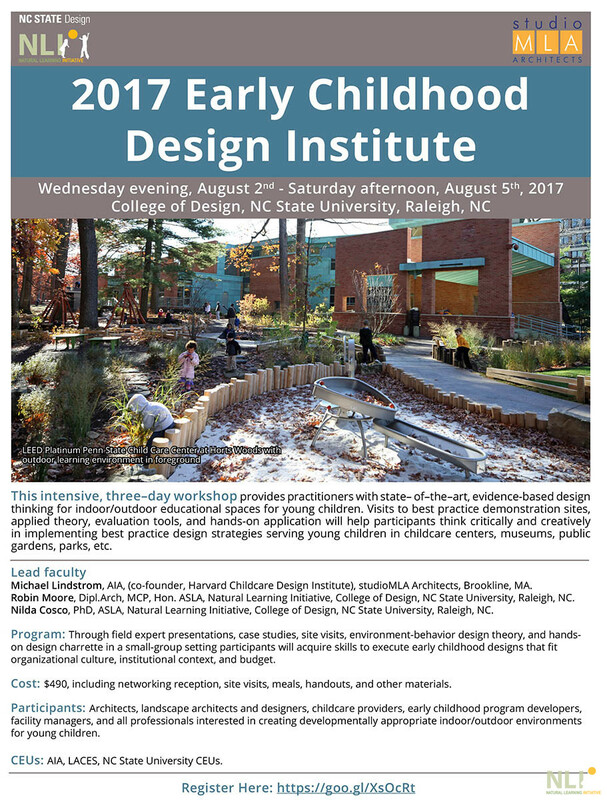 ASLA, Natural Learning Initiative, College of Design, NC State University, Raleigh, NC. Nilda Cosco, PhD, ASLA, Natural Learning Initiative, College of Design, NC State University, Raleigh, NC.